If you're interested in making your home or commercial space more secure, you need to know some important facts about home alarm systems and how they work. By learning which systems often specific advantages, you'll be able to select the system that offers you maximum protection at a price that you can really afford. To help you get the information that you need (in order to make a wise and informed decision about home alarm systems), we've compiled a practical quick guide. Whether you're looking for a basic and affordable system that offers a good degree of protection, or a cutting-edge, high-tech system with all of the bells and whistles, you'll find that today's best home alarm system providers offer plenty of choices at a wide array of price points. For those who don't have a lot of money to spend on home alarm systems, access control systems that are simple and effective may be great ways to beef up security without busting budgets. Examples of effective home alarm systems that utilize access control include electronic keypad entry systems. These systems require that a numeric code be entered into an electronic reader before a door, elevator or gate will open. Since most homes will only need one of two keypads, which may be rigged up to home alarms that alert home owners to the presence of intruders, they offer affordable benefits. These systems may be purchased online, and security system companies will often install and maintain them, in order to ensure that they work according to product specifications. Prices will vary based on the type of hardware that is used. You will need to pay more for quality and expert installation. However, since technology has evolved, the cost of obtaining your own keypad entry system will now be lower than it's ever been before. Another option is a magnetic card reader system that will allows all authorized persons to enter a home by placing their magnetic cards in electronic readers. These readers may be used in or outdoors. Typical home alarm systems of this type are mid-range devices that are more expensive than keypad systems, but less expensive that very advanced home alarm systems, such as biometric readers. At the high end of the home alarm system spectrum, biometric card readers provide the ultimate in home security for a more substantial price tag. These readers work by recognizing personal, physical characteristics, such as handprints, fingerprints, retinas, and facial contours. These security devices are designed to eliminate the risk of security breaches. Home alarm system components may also work well for business and commercial applications. By choosing the system that is best for a private residence of commercial space, it will be possible to enjoy security that comes with monitoring and a host of flexible features. For example, linked systems of magnetic card readers may allow home owners or business owners to keep tabs on their properties, while also making system adjustments periodically. Cards may be changed to keep security tight, codes may be altered to deter intrusions and theft, and biometric systems will allow owners to add or delete users whenever it is appropriate. 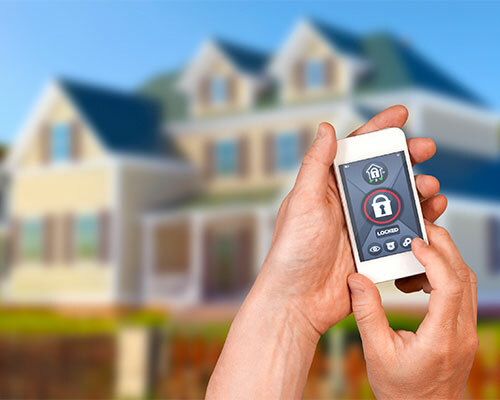 Thanks to the power of high technology, today's best home alarm systems offer great return in initial investments, and they give home and business owners a lot more control over their security systems. When it comes to choosing the system that is right for you, comparison-shopping online will be very important. By checking out various companies and types of security hardware via the World Wide Web, you'll be able to make smart choices that suit your needs to perfection. The best hardware will be world-renowned for its quality and reliability. The best home alarm system companies will also have glowing reputations, so be certain to seek out providers who've received a wealth of positive feedback via the Internet.